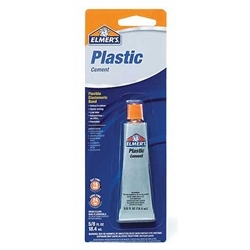 Formulated for most plastics and rubber surfaces, this cement provides a tough, yet flexible elastomeric bond that is quick-curing, low-odor and free of solvents and volatile organic compounds. It sets in 10 minutes with a strong bond, and reaches full strength in 24 hours. Ideal for both indoor and outdoor applications, it dries clear, paintable, waterproof and water-resistant. In a .63 fl. oz. tube.